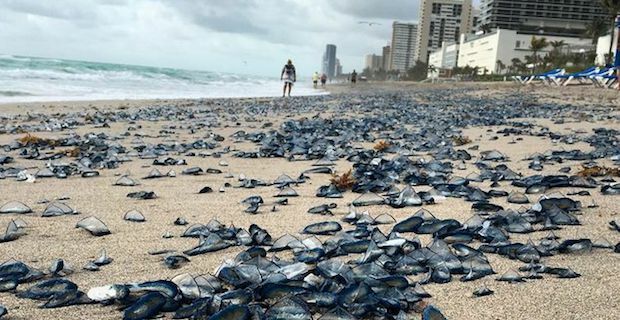 Late last week Hallandale Beach in south Florida was covered with thousands of jellyfish. Thankfully the beach goers had nothing to worry about as these squishy guys were harmless and made for a spectacular sight. These jellyfish are known as velella velella or ‘purple sailors’. Their bodies are only 1-3 inches and have small tentacles that they use for catching prey. The blue/purple colour that they have is complemented by their specially designed clear ‘sails’. The strong ocean currents and wind last week caught the fins and lifted them on to the shore. According to city officials, this tends to happen every three years. They flew a purple flag to notify swimmers and visitors of the conditions. They posted on social media that ‘Public works beach tractor did rake numerous [jellyfish], but they continue to wash up and cleanup will be a gradual process.’ Eventually they cleared them all by the next day. Many of the beach visitors were not impressed, but the locals seemed used to it and were hardly phased by the sight. There were many though who thought they were ‘Portuguese man-of-war’ which are very similar in color but have longer tentacles and are much more dangerous. So in another three years this Florida beach will transform once again into a jellyfish landing pad. A rare sight to say the least and worth checking out if you are around the area.